Angie’s List: Is the Service Site Worth Its Membership Fee? When in the course of human events it becomes necessary for consumers to declare their independence from large telcos, it's reassuring to know that wireless Internet service providers (WISP) are one possible option. Wireless ISP's (WISP) are usually located in rural areas not served by any other Internet service, but some urban WISP's have gained a foothold. One of these is DC Access, LLC (www.dcaccess.net) which serves sections of the Capitol Hill and Adams Morgan neighborhoods in the District of Columbia. DC Access provides a “fixed wireless” Internet service. You'll pay about the same as you would for Internet service from the big telcos (Verizon, Comcast, and so on), but you'll be treated a whole lot better when you call for support. Any small business that doesn't provide outstanding customer service is a small business on its way to being a former small business. From all reports I've heard, the quality of customer service and tech support from DC Access is very high. Reviews on Yelp start out at the effusive level and go up from there. My own experience with other wireless internet service providers has been iffy. I tried Clear last year and found that you needed to line up the Clear modem in just the right direction, and even then your Internet signal could be dropped for no reason. I wanted to like the Clear service--as an alternative to the big telephone companies, but I cannot currently recommend it. I asked DC Access about wireless reliability issues, and the folks there explained to me that before they install an antenna on your roof, they first do a site survey. 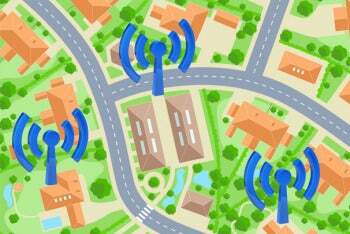 Not all buildings within a fixed wireless geographical area are well suited to receiving fixed wireless. A large tree, for example, may block the line of sight to the fixed wireless transmission tower. DC Access will not install fixed wireless on a building unless the building passes its site survey. If the building does pass muster, then the customer has reasonable assurance that its Internet service will be reliable. Signing up for the DC Access fixed wireless service requires paying a $99 installation fee, which includes leasing of the installed equipment--a roof antenna and a wireless router in the building. This equipment belongs to DC Access and must be returned when service is terminated. If more people had access to reliable Internet service provided by a small business in their own neighborhood, a vast migration of customers from the large telcos would take place. At that point, those large telcos would have to compete for your business. Imagine that! They might even have to put you on hold for less than one hour. I asked DC Access how long they put their customers on hold. The answer? Never. A rep replied, “We either answer your call or route your call to voice mail. Voice mail gets answered promptly.” My heart skipped a beat when I heard that this Internet service provider doesn't put its customers on hold. ISP customers have been mistreated for so long, we've forgotten what it's like to be treated right. Finally, I asked DC Access if it has have any expansion plans. The company explained: “DC Access expands its network through partnership property management companies or condominiums. Sometimes DC Access might seek out the building to expand its network and sometimes the condo board or a renter might contact DC Access for service or a with proposal on service in the whole building. DC Access is always looking for buildings that expand the network or fill in 'dead zones' in the network.” Our only hope against big telcos is to build our own community-scale telcos. Raise a glass with me to small business, won't you? I salute the entrepreneurship of the folks at DC Access and hope their success gives courage to entrepreneurs in other cities--and in rural areas--to follow in their footsteps.